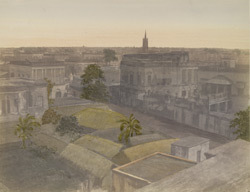 A hand-coloured print of a view of Calcutta from the 'Fiebig Collection: Views of Calcutta and Surrounding Districts', taken by Frederick Fiebig in 1851. Calcutta was established in 1690 by the British as a trade settlement and became the capital in 1772. It remained the capital city of the British Raj until 1912 when the capital was moved to Delhi. Before the arrival of the British, Calcutta consisted of three villages - Sutanuti, Gobindapur and Kailkata - that were along the east bank of the river Ganges.